Charles Darwin's private papers and handwritten manuscripts are preserved in public institutions and private collections around the world. Darwin Online provides images of c. 20,000 of these, making it the largest collection ever published. The online images are mostly scans from copies of black and white microfilms produced by the Cambridge University Library Imaging Service in the 1990s. For online publication now a slight colour tint has been added to many and the brightness and contrast have been digitally enhanced. Please note that many of the Darwin papers have been re-catalogued since microfilming in the 1990s. In some cases items have be re-ordered or moved to other volumes in the archive. In such cases the electronic images may not match the current arrangement of the papers in Cambridge University Library. The immense value of this vast collection of material far exceeds the disadvantages of the occasional unreadable image and the lack of full colour. Several million pounds and years of production would be needed to produce colour digital images of the Darwin Archive. Hopefully this will eventually be achieved. In the meantime, most of the world's finest collection of Darwin's original manuscripts is now available for all to read, study and explore online and free of charge. All manuscripts and private papers on the site can be found by searching the manuscript catalogue. Almost all previously published transcriptions are reproduced on this site (Click here). New transcriptions are also being prepared by and for Darwin Online, following the manuscript transcription policy which provides a clear text, largely free from brackets marking insertions and deletions. Alterations to the manuscript can be studied in the online images, and in all cases of doubt, by consulting the originals. 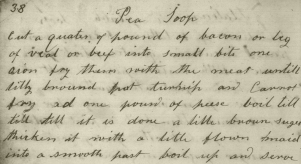 Significant new transcriptions include Darwin's Beagle Diary, his field notebooks kept during the Beagle voyage and his diary or Journal (DAR158) from a working transcription provided by the Correspondence. Many recollections by Darwin's children and friends after his death have also been transcribed, providing unique and fascinating details. 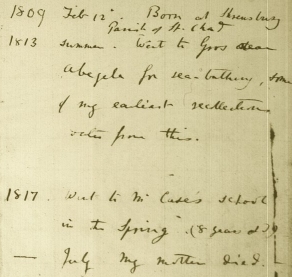 Emma Darwin's diaries are available as images. The vast majority of the manuscripts are currently available as images and therefore not yet searchable (although searching the catalogue is extremely useful). After Darwin's death in April 1882 most of his papers remained in the family. Francis Darwin collected many other papers and especially letters in preparation for writing Life and letters of Charles Darwin (1887). Following the death of Darwin's wife Emma in 1896, the manuscripts of the original drafts of his theory of evolution written in 1842 was found in a cupboard under the staircase at Down House, the family home. They were in parcels each containing small packets of manuscript wrapped in tissue paper on which the subjects had been noted in Darwin's hand. They were presumably just as Darwin left them, and accordingly this arrangement was preserved when they were bound, the volumes now representing as closely as possible Charles Darwin's papers in the order in which he left them. Beside the original papers there were copies of a large number of letters to Darwin, collections of press-cuttings, etc. In broad terms, classmarks DAR 1-28 are assigned to papers relating to his publications, DAR 29-42 to papers concerned with the zoology and geology of the Beagle voyage. Letters and notes are in DAR 43-52. DAR 53-90 contain further manuscripts concerning publications, together with much associated correspondence. DAR 91-118 contain correspondence, DAR 119- 130 represent various notebooks, while DAR 131-141 contain records relating to published papers re Darwin and his work. DAR 142 is a collection of specimen seeds. DAR 143-156 contain further letters, and DAR 157 has a few folios of the On the Origin of Species manuscript. This completes the listing of the collection as at 1960. Of the supplementary papers, DAR 158 is Darwin's 'Journal', DAR 159-184 contain further correspondence, DAR 185 and 186 miscellaneous accessions, DAR 187-197 notes and papers relating to publications, DAR 198-205 further letters, DAR 206-209 experiments and notes, DAR 210 and 211 more letters, while DAR 212 and 213 have manuscripts and proofs of publications. The remaining classes, DAR 214-241, are assigned to the papers of family members and other miscellaneous deposits, including photographs. Other material relating to the Beagle voyage and domestic matters, gardening, poultry, pigeons and so forth were deposited at Darwin's old home, Down House, Downe, Kent, for use in displays for the public visiting the museum. The house is now beautifully restored and preserved by English Heritage. Click here. The Darwin papers cover most of his life from childhood through to his death in 1882. During the Beagle voyage (1831-6) Darwin made notes in fifteen field notebooks. He kept three specimen notebooks for stuffed animals and dried plants, three specimens in spirits of wine notebooks and four geological specimen notebooks for rocks and fossils. Darwin summarized his notes into memoranda that could be given to subject experts who would identify his collections back in England. He kept a personal diary of his experiences and two large collections of notes known as the zoological diary (DAR30-31) (which despite its name is c. 20% on plants) and the geological diary (DAR32-38). After the Beagle voyage Darwin continued to make notes on his burgeoning scientific and theoretical interests in a series of notebooks. In the 1840s Darwin stopped using notebooks and continued to make notes on loose slips of paper which he organized into subject portfolios. In 1908 Darwin manuscripts, photographs, portraits and artifacts were displayed at the Linnean Society of London for the fiftieth anniversary of the 1 July 1858 meeting when the Darwin-Wallace paper was read. (See the catalogue here.) From 22-24 June 1909, the centenary of Darwin's birth and the 50th anniversary of the Origin of Species, many Darwin manuscripts and artifacts were displayed in the Old Library of Christ's College, Cambridge. (See a catalogue here.) Much of this material was displayed at the British Museum (Natural History) in July 1909 alongside items from its own collections. Some of the material lent to that exhibition by the Royal College of Surgeons' Museum in Lincoln's Inn was destroyed in the Second World War. See the catalogue of the exhibition here. An important early handlist of the papers at Cambridge University Library was published in 1960. (Click here.) A much more thorough and accurate catalogue was created for the Library by Nick Gill in 2004. The portion of this catalogue pertaining to Charles Robert Darwin (as opposed to his descendants), in most cases up to 1883, constitutes the majority of the online Darwin Manuscript Catalogue although items from over twenty other institutions around the world are also included. The complete Darwin Archive catalogue from Cambridge University Library is available (as of 2004) as a 7MB PDF file. A supplement to the Cambridge University Library Darwin catalogue is maintained by the Library; this too has been included in the database with permission. See the important appendices on Darwin's manuscripts in The correspondence of Charles Darwin vols. 1 & 15 and the introduction by Sandra Herbert and David Kohn in Barrett et al 1987. See also R. B. Freeman's (1977) introduction to published transcripts. An extract from Darwin's barnacle slide catalogue, now at the Zoology Museum, Cambridge. • The first drafts of Darwin's theory of evolution: the 1842 sketch and 1844 essay. • Darwin's papers from the Beagle voyage. Click here. • Darwin's religious views: Emma Darwin's 1839 memo, and an entire volume on the subject. Click here. 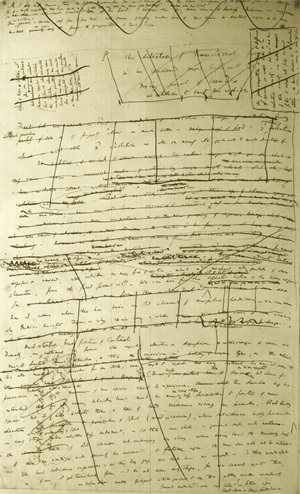 • Drafts of Darwin's unpublished 'big book', Natural selection. Click here. • Notes & drafts for his book Descent of Man. Click here. • Unpublished photos collected for Expression of the Emotions. Click here. • Reviews of Darwin's works. Click here. • Darwin and experimentation on animals. Click here. • Caricatures, cartoons & sketches of Darwin. Click here and here. • Darwin's accounts with his publisher John Murray for 1881. Click here. • Obituaries of Charles Darwin, Click here, here and here. • Items in French, German, Spanish or Italian. See a list of all available online images of Darwin's papers. Click here. • Abstract — Darwin's reading notes. 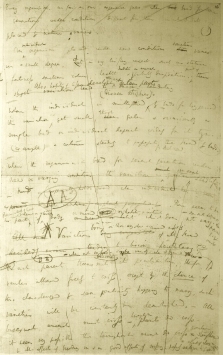 • Draft — Darwin's rough drafts of his many publications. • Figure — Drawings and diagrams. • Note — Includes most of Darwin's notes, usually organized into subject portfolios. • Printed — Published items such as reviews of Darwin's works or clippings he collected for his researches. Requests to reproduce manuscripts must be sent to the owner of the manuscript, not to Darwin Online. In most instances enquiries about this should be addressed to Adam Perkins, Curator of Scientific Manuscripts in the University Library (ajp21@cam.ac.uk or mss@lib.cam.ac.uk).